On a small side street in Bethlehem, just off Manger Square, there is an unassuming church complex made of smooth, sandy stone. Passing through the arched entrance gate, a visiting pilgrim will first enter into the ancient Byzantine Church of the Milk Grotto, built to honor the spot where a drop of Mary’s milk fell when she uncovered her breast to nurse the infant Jesus on their flight to Egypt. At the back of the grotto there is a modern tunnel that leads to a serene chapel. At the heart of the chapel, a tabernacle featuring two iridescent olive trees shines behind a golden monstrance. In front of that monstrance, a single religious sister clad in red and white kneels before the milky white host at every hour of the day and night. These sisters—the Perpetual Adorers of the Blessed Sacrament—keep watch here in this chapel, which was dedicated as the International Center of Prayer for Peace in the Holy Land in March 2016. The order has a monastery next door to the Milk Grotto Church. Although visitors can see through a pane of glass to the dazzling tabernacle, the silent, kneeling sister is completely inaccessible. The glass reaches from halfway up the wall to the ceiling, and the entrances to the chapel are locked. As sisters take shifts, they unlock the door and pass the key back and forth to one another. Eucharistic adoration is not simply a private alternative of what ought to be a deeply communal celebration. The Perpetual Adorers of the Blessed Sacrament were founded by Caterina Sordini, a slightly eccentric-sounding 18th-century figure who took the name Mary Magdalene of the Incarnation upon joining a Franciscan community. In the spring of 1789, Sister Mary Magdalene received a vision of Christ while she was in ecstasy. Christ appeared to her in the form of the Eucharistic host on a throne, surrounded by a host of virgins adoring him. Jesus asked Sister Mary Magdalene to found a society of sisters who would adore the Eucharist constantly, in reparation for the sins of the world. As I read the pamphlet detailing Mother Mary Magdalene’s vision and watch the silent sister pray in front of me through bullet-proof glass, I find myself overwhelmed by a wave of discomfort, bordering on distaste. This order’s founding story sounds like a fairy tale; this practice of prayer in front of a piece of bread seems foreign and superstitious. I cannot make sense of it. It seems inimical to the communal life the Eucharist is meant to provide. Our physical appearance is molded by who we look at and who we seek to conform ourselves to over the course of a lifetime. Thus, eucharistic adoration is not simply a private alternative of what ought to be a deeply communal celebration. Rather it ought to lead those who encounter it back to the heart of that communal mystery. How can simply looking at the host be a communal act? Why are these women spending all their time staring at the invisible God in bread? And as a pilgrim in the Holy Land, of all places, wouldn’t it be more worthwhile to visit the Church of the Nativity, down the road? One possible answer to my question came from an unexpected source: a study conducted by the University of Michigan’s psychology department, which found that spouses married for over two decades begin to look like one another. In a controlled study, university students identified photos of couples and found the photos of couples after 25 years of marriage resembled each other more closely than the photos of the same couples when they first were married. The researchers posit several potential causes for this facial convergence. One hypothesis is that human facial muscles move in response to emotion. The habitual use of these muscles over an extended period of time could permanently transfigure the physical attributes of a person’s face. When one person attempts to empathize with another—as each spouse asks about the other’s day, attempts to match and enter into the other’s moods and understand each other’s hurts and joys—the mental and emotional effort is matched by a physical effort. By sharing the other’s inner emotional state, the spouse’s muscles begin to mirror the other’s outer self. “One flesh” takes on a quite literal dimension. As we kneel or sit in adoration before this piece of bread, Christians gaze at the face of God present. The University of Michigan study notes that consistent, prolonged social contact may be the strongest basis for facial resemblance, potentially even more powerful than genetic structure in explaining resemblance among siblings. Our physical appearance is molded by who we look at and who we seek to conform ourselves to over the course of a lifetime. In Eastern Rite Christian churches, the interiors are plastered wall-to-wall, floor-to-ceiling with faces. These icons, images of holy men and women, are not static works of art or prayer props but rather active entities that draw the viewer into the mystery of love they portray. Liturgies in an Eastern rite church invite worshippers to come face-to-face with the living God by encountering the faces of the painted saints that surround the living saints gathered for the Eucharist. Perhaps this strange Catholic practice of staring at what appears to be nothing more than a wafer of beige wheat can be related to both the tradition of Eastern icons and the transformative, empathetic gaze of spouses. Perhaps this ritual of gazing at the Eucharist can be a deeply communal, relational activity. The Eucharist offers Christians communion with God not just through the liturgy but as a living icon. As we kneel or sit in adoration before this piece of bread, Christians gaze at the face of God present. Just as spouses seek to love with one another’s hearts, to truly live and feel with one flesh, so the Christian seeks to conform her entire self to the God of love. I think again of the sisters at the Milk Grotto who seem to be passive, static figures. They kneel before God in what might appear to be an isolated form of prayer. But, perhaps, what they are doing is a radical act of peace in a war-torn and violence-ridden land. As we absorb the peace, the availability, the radical and humble love of God in the Eucharist, we go forth to imitate that love—to be icons of that love for our neighbor. Perhaps the members of the body of Christ who gaze in prayer at the body of Christ in bread gain a family resemblance not only with the Son of God but with one another. As the Christian goes forth to bear her neighbor’s cross and share her neighbor’s joys, she can begin to glimpse the eucharistic face of God in her neighbor, too. Well, my objection or discomfort or scepticism lies in an entirely different direction. What are we to do with food as ordinary Christians? Well, first we do well to pray for it to come tomorrow as it has come today - " ... give us this day our daily bread ... "
Then we do well to give thanks for it just before we consume it "Bless us, O Lord, and these, Thy gifts, .. from Thy bounty ..."
Then we EAT IT. Maybe a "thanks Mum" and "doesn't it look lovely" to a special festive spread. Adoration is a meditative, contemplative practice and licit as far as that goes and used to be widespread as Benediction. What you have given me is an historical fact which was unknown to be until I read this. A private revelation to one person started the Perpetual Adoration. Can anyone direct me to whether this was an approved revelation by the Church officially at any time? The History, Theology, and Psychology of Eucharistic Devotion"
we are the body of Christ!! !--- not a piece of bread. someone decided that when it was decided the the ''we'' was too complicated. Jesus died so that he could become more aligned to us; we are supposed to be the bread of Angels and the Eucharist is there to remind us of that. We need to see Christ in the faces of the needy, of the frightened, of the dirty, of the smelly -- of all those that our societies marginalize. The idea of a single nun, kneeling before the Host, behind locked doors and bullet-proof glass is, frankly, offensive. Adoration is a sacramental and can only be done by being setting up by an ordained minister and therefore by practice this is an enforced clericalism that reinforces the great divide between us, the faithful and all clerics. It also reinforces the utter and complete otherness of God vs the God who lives within and surrounds all of us. I believe we should praise, worship and adore and pray to God but that can be done privately at home, in the workplace and also in our churches especially at Eucharist where we can consciously and deliberately say out loud our Amen to the Lord of our lives and to take him into our mouths and bodies to become more like Jesus in our lives. This is so much more superior to a "me and my God" prayer in front of Jesus enthroned in a shiny object behind glass. I'm sure God understands and appreciates this but intention, attention and with what concrete results makes all the difference for what kind of worship we bring to this sacramental or any other kind of ritual. The vision of Mother Mary Magdalene and the comparison to iconography are not good arguments in favor of the practice. Neither is a study about interaction with a spouse or partner, since part of that interaction is the freedom to argue without fear of abandonment. We abandon Christ, he never abandons us, although there is a long tradition in Judaism of being angry at God. I do not recall ever experiencing sacramental grace in this devotion? Has anyone? I know I do so in Communion, but not in adoration,. Have we turned the host into a graven image? The iconoclasts may have had a point, although the response is that it is a very human need to have a god you can see, although Muslims seem to be very good at iconoclasm. To be clear, I am not denying the Full Presence of God in the Sacrament. Not at all. It is in the reception that we encounter Christ, not in adoration. We took this practice from the Aztecs. It is not ancient in the Church. It is piety for piety's sake and it is only true as a belief. It cannot be proven because doing so is reception. It is a pious belief that is immune to verification. We have only the second part of the First Commandment go guide us. Sadly, everyone demands a god that can be left on the pedestal. Such a god is safer at a distance, especially if he is a feared Ogre who seeks to winnow us out rather than draw us to him because he has experienced the sorrow of our humanity. I believe in the latter. God is within us when we receive him and when he act as he would, challenging self-reliance and self-righteousness, both in the Church and Society. As Tatiana pointed out above, we see Jesus in the faces of the needy, not the powerful adorned in gold. 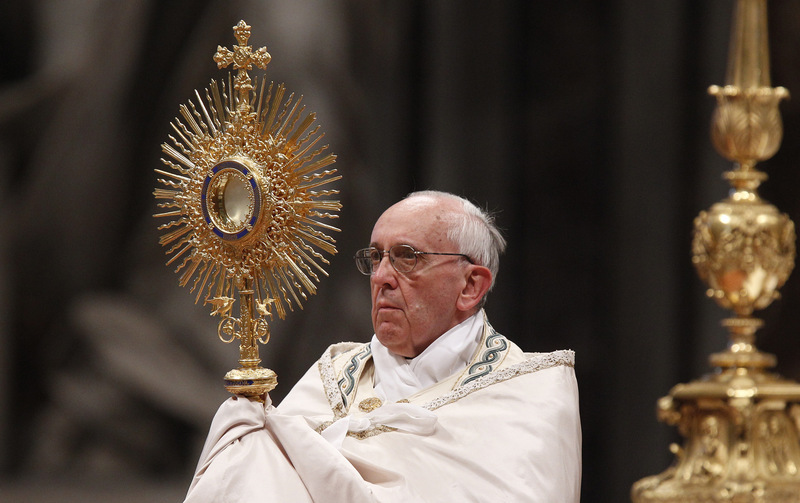 The Monstrance is not a place that Jesus of Nazareth would seek. I think Renee is really on to something. I've seen the same rapt adoration on the faces of Hindus gazing at Krishna. I was impressed. Adoration changes the soul, and the soul in time changes the body. Thanks for this article, Renee. To the naysayers, the Church is a big place. There are many devotions and forms of prayer. You don't have to do Eucharistic Adoration if you don't want to. Our parish does perpetual adoration, and I have had a weekly hour for nearly 20 years. It isn't "instead" of anything. We can be "both/and". I do believe that the Eucharist is a meal, and a sharing in the Body of Christ. We can help the poor and disenfranchised. And also adore Christ in the reserved sacrament. For me it is a conversation, and just sitting in the presence of a loved One. It isn't meant to be a zero sum thing, that we do instead of doing other things that we need to do . Sometimes it leads me onto paths that I wouldn't have gone down on my own. The big take-away lesson is that I am not on my own. I'm not really sure that the author has learned to love Eucharistic Adoration. The discussion is rather wandering, between oriental iconography and facial likeness of spouses. Perhaps she does love it now, and certainly Adoration is wonderful, but her articulation of her views is almost incomprehensible. The author's comments suggest that the Eucharist is Christ made present by the presence of the community; I thought this heterodoxy had faded a decade ago. The citation of Eucharisticum Mysterium is exactly opposite from this view. The presence of Jesus in the Eucharist is not like "when two or three are gathered in My Name." It "derives from the sacrifice"—the action of Jesus through the priest, which is the same even in celebrating Mass alone. The repeated reference to the Eucharist as "a piece of bread" reflects an insensibility to the Real Presence. Now granted, in our mortal life it's indeed difficult to perceive Jesus in the host—apart from some jarring Eucharistic miracle. But He's there. We believe the host is the sacramental Body of Christ. We also believe that the people are the Body of Christ. In fact, Jesus becomes present in the sacrament not so much as a theophany (which the host really is not) to be adored but rather as the Bread of Life to nourish His presence in us. We Catholics show great reverence to Jesus in the host, both at the time of consecration and later in Benediction. If we showed half that reverence to the same Jesus in the sick, the hungry, the imprisoned, the homeless, et al. (Mt 25), this world would be a dramatically better place for all. “As often as the sacrifice of the cross in which Christ our Passover was sacrificed is celebrated on the altar, the work of our redemption is carried on, and, in the sacrament of the Eucharistic bread, the unity of all believers who form one body in Christ (Cf. 1 Cor. 10:17) is both expressed and brought about” (#3). The Eucharist has a function and purpose: it helps to “bring about” the unity of believers. “Really partaking of the body of the Lord in the breaking of the Eucharistic bread, we are thus taken up into communion with Him and with one another. ‘Because the bread is one, we though many, are one body, all of us who partake of the one bread’ (1 Cor. 10:17). In this way all of us are made members of His Body (1 Cor 12:27 – ‘Now you are the body of Christ and individually members of it’) ‘but severally members one of another’ (Romans 12:5).” (#7). “The Church continually lives and grows” by the Eucharist (#26). “By the sacraments, especially holy Eucharist, that charity toward God and man which is the soul of the apostolate is communicated and nourished” (#33). The Eucharist is meant to nourish our charity. This is not to suggest that adoration of the Blessed Sacrament has no place in Catholic piety. But what we have just seen in these quotes shows how the Church emphasizes the role of the Eucharist (as Bread to be shared and eaten) in the formation and strengthening of community. To author Ms Roden, adoration of the Blessed Sacrament “seems [or seemed] inimical to the communal life the Eucharist is meant to provide.” She then describes how she has come to appreciate the communal, relational dimension of adoration. In my view it is not necessarily inimical to the communal life; it may be complementary. But strengthening communal life should be seen as the primary purpose of the Eucharistic presence. Finally, it is very significant that in the Mass the consecration comes after the celebration of the Word, where we come to know Jesus better as presented by the evangelists, love him more deeply, and commit to follow him in our lives. Keeping the Gospel united to the Eucharist helps us to truly resemble Jesus of Nazareth, to be the living Body of Christ in the world. The aspirants can make use of the golden opportunity if they apply for the jobs at Sarkari Naukri. Sarkari Naukri is one of the best websites to provide the notifications for all the government jobs to the aspirants who write Sarkari Result.